California’s leadership in climate change policy is built on a strong foundation of research addressing the impacts of climate change on the state, as well as strategies to dramatically reduce greenhouse gas emissions. In turn, the state’s research responds directly to policy needs and is enacted through Safeguarding California. Please visit www.ClimateAssessment.ca.gov to access the full suite of research products from California’s Fourth Climate Change Assessment. California is a global leader in using, investing in, and advancing research to set proactive climate change policy, and its Climate Change Assessments provide the scientific foundation for understanding climate-related vulnerability at the local scale and informing resilience actions. 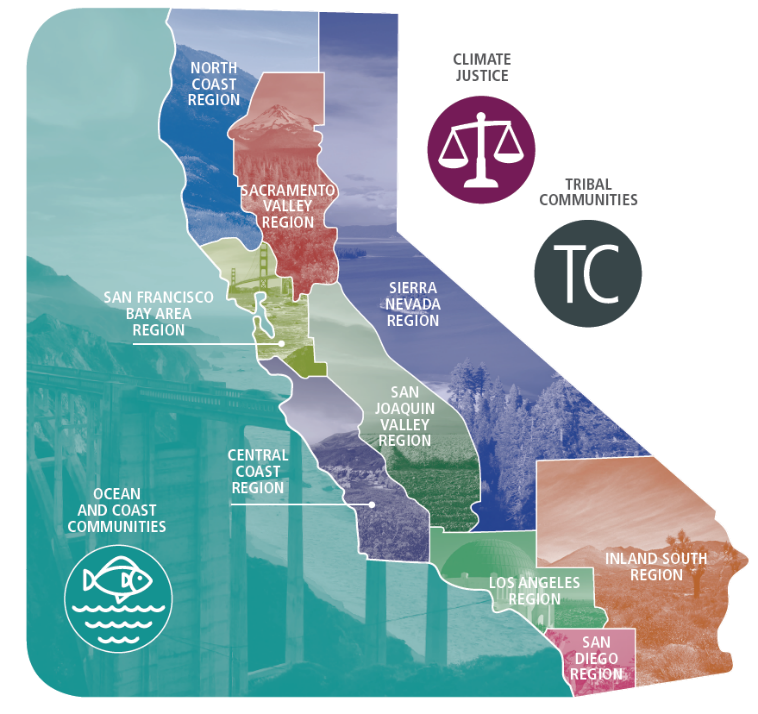 The Climate Change Assessments directly inform State policies, plans, programs, and guidance to promote effective and integrated action to safeguard California from climate change. This cutting-edge research initiative is comprised of a wide-ranging body of technical reports, including rigorous, comprehensive climate change scenarios at a scale suitable for illuminating regional vulnerabilities and localized adaptation strategies in California; datasets and tools that improve integration of observed and projected knowledge about climate change into decision-making; and recommendations and information to directly inform vulnerability assessments and adaptation strategies for California’s energy sector, water resources and management, oceans and coasts, forests, wildfires, agriculture, biodiversity and habitat, and public health. In addition, these technical reports have been distilled into summary reports and a brochure, allowing the public and decision-makers to easily access relevant findings from the Fourth Assessment. This brochure is a component of the Identification of Natural Infrastructure Options to Sea Level Rise project. It summarizes natural infrastructure projects for a range of settings in coastal California to address the gap in familiarity with natural infrastructure and the lack of technical guidance to aid decision-makers and engineers in the appropriate application of different strategies. Additional information and project-related materials can be found at www.coastalresilience.org. This blog hosts high-level posts about the workshops and findings from the Drought Planning and Climate Adaptation of Small Self-Sufficient Water Utilities in California project, as well as several other supporting research projects. This website hosts recordings of four webinars and a summary of a workshop conducted in support of the Climate-Wise Landscape Connectivity: Why, How, and What Next project. The state has completed three prior Climate Change Assessments. The first California Climate Change Assessment (First Assessment), completed in 2006, began the work of trying to “downscale” global climate models in order to provide information about expected climate impacts at a regionally-relevant scale. Climate impacts will not be uniform across the world, and it is necessary to have climate impact information at a finer resolution (i.e. the western United States, the state of California, subregions and communities in California) in order to craft local, state and regional climate policies and solutions. The First Assessment provided support for passage of AB32 and the development of the Air Resources Board’s (ARB) 2008 Scoping Plan for reducing greenhouse gas emissions. The second California Climate Change Assessment (Second Assessment), completed in 2009, provided initial estimates of some of the economic impacts of expected and unfolding climate risks in the state, such as costs to coastal economies from sea level rise. Expected climate impacts will have very significant economic impacts that may be reduced with appropriate measures to reduce climate risks. The Second Assessment provided support for the state’s 2009 California Climate Change Adaptation Strategy, the state’s first multi-sectoral effort to plan for climate risks. The third California Climate Change Assessment (Third Assessment), completed in 2012, was shaped by requests for additional information regarding state vulnerabilities to climate change, including: 1) the need to better understand institutional barriers to efforts to prepare for climate risks, 2) risks in specific sectors (water, energy, agriculture), and 3) risks at the local scale. The Third Assessment supported the development of the Safeguarding California Plan for reducing climate risk (an update to the 2009 California Climate Change Adaptation Strategy). The significant advances in climate science in the Third Assessment allowed the Safeguarding California Plan to expand and refine recommendations for reducing climate risk in California. California’s Climate Change Research Plan, released in 2015, articulates near-term climate change research needs to ensure that the state stays on track to meet its climate goals. The Fourth Climate Change Assessment is the first inter-agency effort to implement a substantial portion of the Climate Change Research Plan. For more information about the state’s prior climate assessments, please see the California Climate Portal. Cal-Adapt is a web-based climate adaptation planning tool. Cal-Adapt allows the user to identify potential climate change risks in specific geographic areas throughout the state. Users can either query by location, or click on an interactive map to explore what climate impacts are projected to occur in their area of interest. This tool is integrated into resources like the Adaptation Planning Guide for local and regional governments. It helps communicate science from California’s Climate Change Assessments and other groundbreaking projects to all Californians, illustrating state government’s commitment to making the best available science actionable. We are actively updating our climate tools and building new ones. A new Public API allows for the third-party development of web-based tools that draw from the climate data on Cal-Adapt. California Local Energy Assurance Planning Tool: The California Local Energy Assurance Planning (CaLEAP) program is a California Energy Commission sponsored project to assist local governments throughout the State in preparing plans to ensure that key assets are resilient to disaster events that impact energy. The CaLEAP Planning Tool is a designed to help local governments develop Energy Assurance Plans (EAPs). CalEMA’s MyPlan: MyPlan is a map service designed to be a simple interface to California natural hazard data products produced by the California Natural Resources Agency departments and other government agencies. This Web site is provided by Cal EMA to allow users to easily make hazard maps for preparing, upgrading and reviewing Local Hazard Mitigation Plans (LHMPs), General PlanSafety Elements, Local Coastal Plans (LCPs), and hazard mitigation projects. CalEMA’s MyHazards: Use this website to discover the hazards that exist in your area and learn how to reduce YOUR risk! Remember, the best way to recover from disasters is by reducing the risks before a disaster strikes. Click here to sign-up for the CNRA Climate ListServ.